Thinking of Switching? 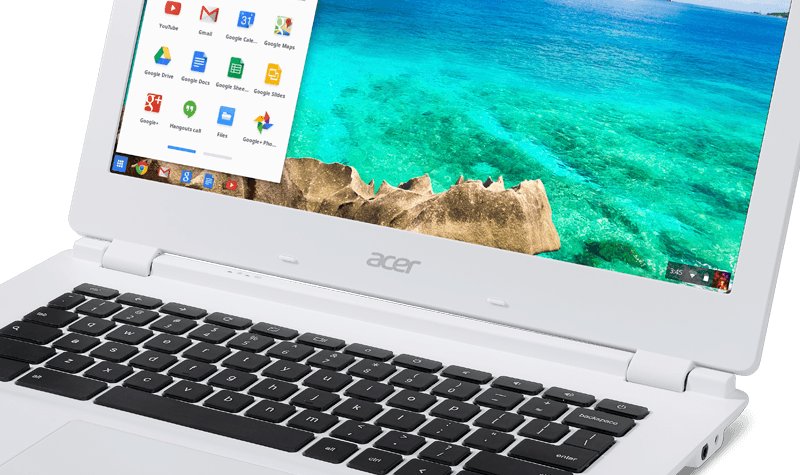 Already have a Chromebook? Either way, get to know Chromebooks and learn how you can do everything you need and love to do. Chromebooks come with free apps like Google Docs, Sheets, and Slides, which let you create documents, spreadsheets, and presentations in real-time with other people, and don't have to sweat losing any of your work since your files are automatically backed up online. You can also open and edit Microsoft Word, Powerpoint, or Excel files. Google Docs is an online word processor that lets you create and format text documents and collaborate with other people in real time. It even works when you're offline! 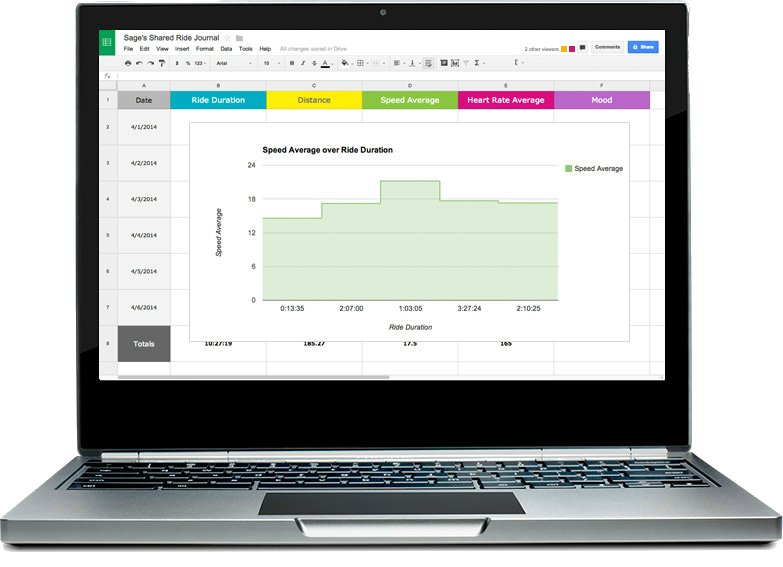 Google Sheets is an online spreadsheet app that lets you create and format spreadsheets and simultaneously work with other people. It also works in offline mode! Google Slides is an online presentations app that allows you to show off your work in a visual way. You can also find productivity apps at the Chrome Web Store, or use Office Web Apps, a free online version of Microsoft Office, which is compatible with your Chromebook. You can stream movies online using apps like YouTube, Netflix, and sites like Hulu, just like you would on another computer. Just add the app to your Chromebook from the Chrome Web Store or visit their respective websites. You can listen to music using Google Play Music or apps like Spotify and Pandora, much like you would on any other computer, simply by adding the app from the Chrome Web store or visiting their websites. You can find more information about switching to Google Music here. While Skype is not yet officially supported, it is possible to get it working on Chromebooks without too much difficulty. 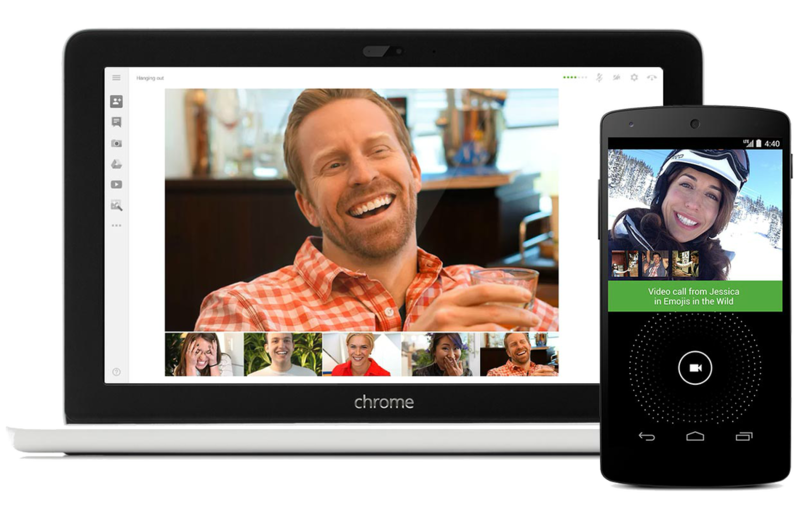 But Google Hangouts works on your Chromebook right out of the box and can be used across devices making it easy to make phone calls, instant message, and video chat. Video chat with up to 9 people at once. You can also use your Chromebook to instant message with friends on Skype, Yahoo, AIM, MSN, and more. Examples include imo, IM+, and eBuddy. You can add these apps for free from the Chrome Web Store. With 100GB of free Google Drive storage for 2 years, you can privately upload any photos that you have on your old computer to the cloud and access them from any device, including your Chromebook. 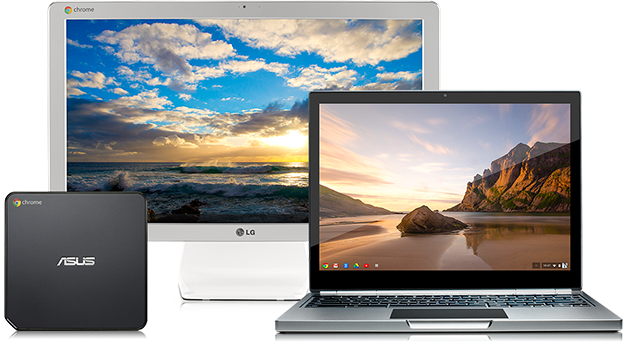 All Chromebooks also come with at least 16GB of internal storage so you can store any must-have photos right on your device. The built-in Google+ Photos app which makes it easy to edit, organize, and share your photos with friends on Google+ and the web. You'll not only be able to view photos or slideshows, but also automatically upload your photos by connecting to camera or SD card. After your photos have been uploaded, you can edit and share them with friends and family. Chromebooks are a new type of computer designed to help you get things done faster and easier. They run Chrome OS, an operating system (like Windows or Mac OS) that has cloud storage, the best of Google built-in, and multiple layers of security. As with other devices, choose your own wallpaper and then use the desktop to help visually organize all your screens. 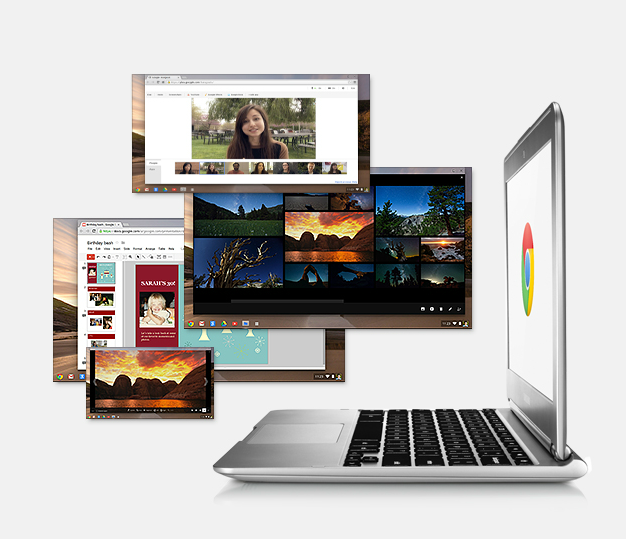 Find all apps that come with your Chromebook or that you added from the Chrome Web Store. Or search the web directly from the launcher. Like Chrome on any other computer, phone, or tablet, the browser is how you browse and access the web. Since you won't have client apps to manage you don't need that much RAM--everything you're doing is being taken care of by super fast and super secure supercomputers. with most of your computing happening in the cloud, you have a supercomputer working on all those tabs you have open, so you can just focus on DOING. 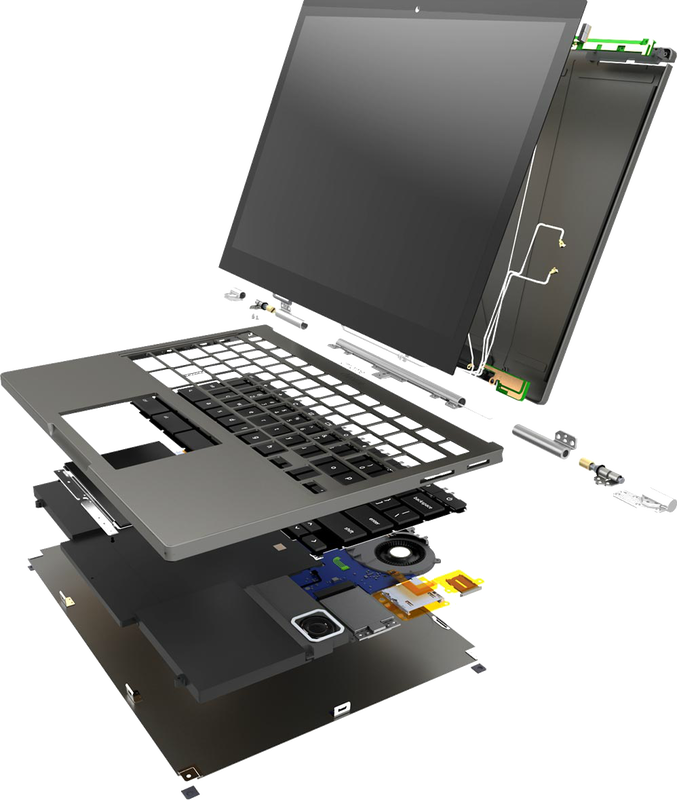 Chromebooks come with smaller hard drives because you have more storage in the cloud. You have some storage on your device for those times you need to access a file without access to the internet, but for everything else you can access and store it in the cloud. And your Chromebook comes with 100GB of free Google Drive storage for 2 years. 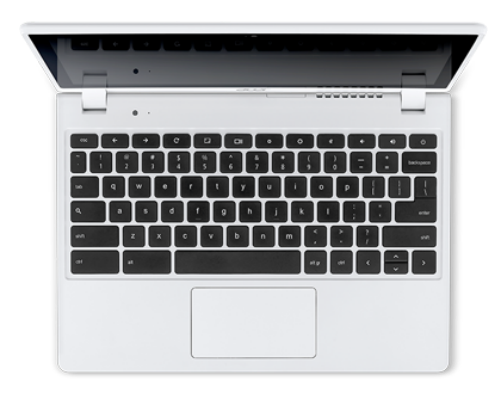 Chromebook keyboards have a few extra features to help you browse the web effortlessly and efficiently. You'll notice that your keyboard contains a dedicated search key and a new row of web shortcut keys. You can also use a standard USB Windows keyboard with your Chromebook and use the same keyboard shortcuts.